From 2007 through 2008, I worked with Dr. Gary Buterbaugh to create a series of virtual labs on human anatomy. Because incoming students had previously taken intensive anatomy and physiology courses, and due to space and budget constraints, dissection labs were being removed from the human biology curriculum. We worked to replace them with online human anatomy reviews that gave students a chance to practice facts and concepts. Heart Structures and Functions (opens in a new window) was a basic site created to assist students in reviewing the basics of the cardiac system, moving from abstracted drawings of the heart to complex images of actual hearts. The Lung Lab (opens in a new window) was a Captivate-based tutorial to review and assess students on their understanding of the basics of the pulmonary system. We also developed a Questionmark Perception-based neuroanatomy tutorial and assessment that included reviews of basic structures using abstract drawings, such as this review of the cranial nerves), (opens in a new window) and this interaction used as part of quiz on the brain structures (opens in a new window), which used actual images of the cranial nerves. In the spring of 2008, I began working with Dr. Neha Sheth, infectious disease specialist, to develop a series of online case-based assessments, using Questionmark Perception. These included an intensive multi-part online workshop on the process of diagnosing, initiating, and refining therapies for infectious diseases in a hospital setting, adaptive assessments of decision-making in HIV drug therapy, and basic assessments of decision-making on a variety of other diseases. While Questionmark Perception is a closed system, Dr. Sheth and I have done a number of presentations on and off campus on our work in using Questionmark to develop online case presentations. The Infectious Disease Workshop: A Questionmark Perception Case Study (opens in a new window) was an hour-long workshop at a Questionmark-hosted Web conference for instructional designers and Questionmark administrators. 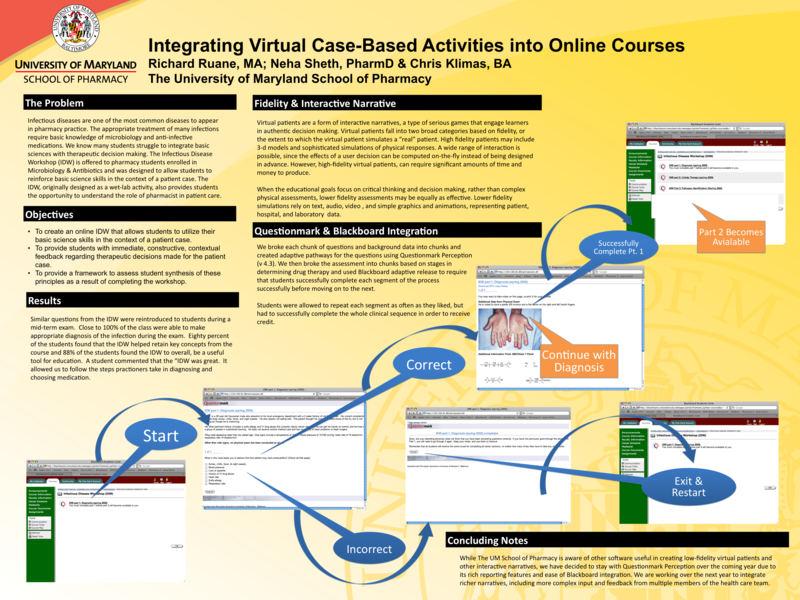 Integrating Virtual Case-Based Activities into Online Courses (large file) was poster sessions we presented with colleague Chris Klimas at Blackboard World 2009. The design for this site is based on the Modern Linguist theme by Joel Goodman. This page was last modified on December 08th, 2011 at 12:29 pm. We also developed a Questionmark Perception-based neuroanatomy tutorial and assessment that included reviews of basic structures using abstract drawings, such as this review of the cranial nerves), (opens in a new window) and this interaction used as part of quiz on the brain structures (opens in a new window), which used actual images.